Hsinchu, Taiwan, January 16, 2012 – Handlink Technologies Inc., today introduced the WG-606 Hotspot Gateway, designed with advanced billing, user authentication, and access control features that help hospitality businesses manage guest accounts easily and generate the revenue with gateway billing functions. This Hotspot solution offers prepaid cards selling and instant ticket selling at the same time. 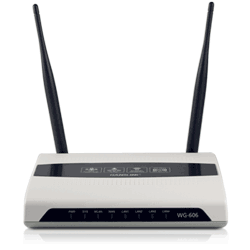 If end users who do not want to subscribe the Hotstpot service or don’t have prepaid card, they can just purchase a Wi-Fi ticket at any the location where the WG-606 has installed and connected with WG-500P P, such as Bed & Breakfast, Coffee Shop, Restaurant, Airport & Transportation Center and Campus Library and Scenic Square. The WG-606 also provides a customized and user-friendly management interface that supports web-based authentication and management tool, and marketing cooperation.